Subpoenas in criminal cases – In criminal matters in the United States of America, those who are accused of a crime are presumed innocent until proven guilty. Further, unless the defendant simply admits guilt, the government must prove each element beyond a reasonable doubt. In order to prove the guilt of the defendant, the government must put up evidence, and that evidence is mostly in the form of witness testimony. The state or federal government puts witnesses on the stand in a criminal case to testify about their direct knowledge of the facts and circumstances in question. The defendant has no burden to testify or put on evidence, but he or she does have the right to present evidence in the same fashion. Witnesses are usually informed and given notice of their duty to testify through a subpoena. 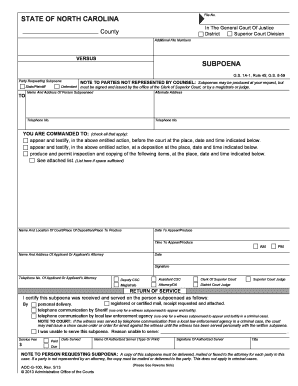 A subpoena is a legal instrument used to inform a person of their duty to provide evidence or information in a case. That can be in the form of coming to court to testify or providing records of other information to the requesting party. Using a subpoena is usually a method to help ensure witness testimony. There is a standard form for Subpoenas in North Carolina for both criminal and civil matters that can be found here. How do people get subpoenas? Subpoenas can be issued by either party in a case. In regards to a criminal case, this would be either the government or the defense. Subpoenas must be served upon the party who is intended to comply. Proof of this service may become necessary during a trial. In civil cases there is a $30 filing fee for subpoenas, but in criminal cases there is no such fee. What happens if I received a subpoena but I don’t want testify or I don’t want to comply? A person who is served a subpoena can challenge that subpoena for good cause within 10 days of service. If someone fails to properly challenge the subpoena, was properly served, and does not show up to court, a warrant for that person’s arrest can be issued. It is a mistake to ignore a subpoena or any document from the court. Subpoenaing witnesses to testify on your behalf is just one of the methods that criminal defense lawyers can use to rigorously defend a criminal case. If you have been charged with a crime, contact us. Gilles law is a Charlotte criminal defense law firm that practices North Carolina criminal defense, South Carolina criminal defense, and Federal criminal defense.